Let’s face it. Any film in this franchise that’s superseded the first one has been mostly ludicrous, so in that regard the latest Dino film doesn’t really steer too far off the template. This time round however, despite the formula feeling a tad jaded, director J. A. Bayona does what he can to rescue it from just being a run of the mill Dino romp by interjecting some depth into the characters (Chris Pratt & Bryce Dallas Howard are much better this time round), and there are some genuinely spectacular scenes filled with awe, interwoven into the film and equally terrifying ones – horror is after all Bayona’s forte (The Orphanage, A Monster Calls). As such, despite not having much competition, it’s easily a distant second to the path-breaking Jurassic Park which is now, believe it or not, 25 years old. 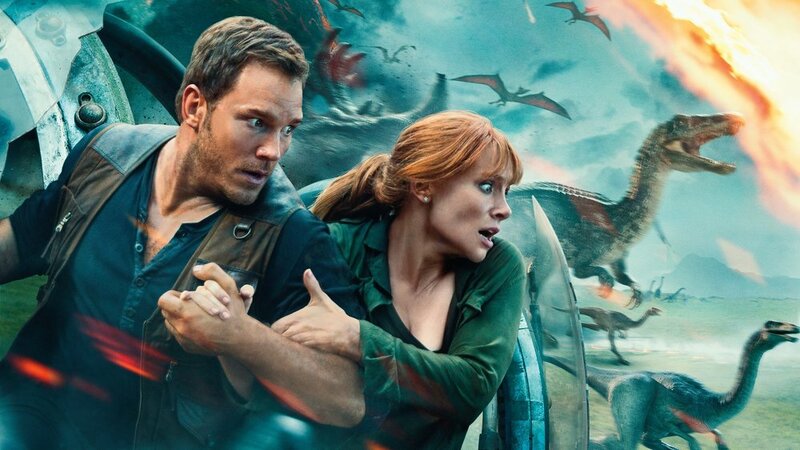 Set three years after the events of Jurassic World, where the dinosaurs ran amuck in an overcrowded amusement park, ironically, Jurassic World: Fallen Kingdom revolves around a rescue mission to save those very creatures from extinction and relocate them to another island as they now face a bigger threat in the form of an active volcano. Reluctantly, Claire Dowling (Dallas Howard) volunteers and sets off on the impossible cause convincing Owen Grady (Pratt), the park's former Velociraptor researcher, to join her so he can locate Blue, the Raptor he formed the closest bond with during his time on the park. Unbeknown to our unsuspecting protagonists however, there’s an ulterior motive to capture the creatures so that they can be bred and sold for profit around the world. Unlike its predecessor the trailers for Fallen Kingdom had set the bar pretty low, and expectations from this instalment were as a result, marginally low. However, there are enough thrills and scares and some genuinely moving moments here (a herd of Brontosaurus’s perishing on the burning island is hands down one such scene), to satisfy that summer blockbuster urge and that climatic cliff-hanger is enough to ensure, that we’ll be back for the next ride. Both Dallas Howard and Pratt are more charismatic and sportingly let the dinosaurs take centre-stage, and the supporting cast consisting of some rather prolific names fill in the blanks and get their moments to shine, prime among them being B.D. Wong and of course Jeff Goldblum, in an inconsequential yet entirely engaging cameo as Ian Malcolm, still as sceptical as ever with man trying to play god and tampering with nature. Getting Bayona on board was a smart choice, because not only does he add a new spin to the proceedings, ticking off the pre-requisite disaster movie checkboxes with flair, but finally takes us off the island and into his comfort zone – gothic, claustrophobic horror while smartly balancing the film with spectacular CGI so it that it satisfies audiences 6 through to 60. Just like Jurassic World though, the end result here too is something of a mixed fare – it’s an utterly satisfying romp that although thoroughly entertaining, remains entirely forgettable, especially when it introduces one dimensional antagonists devoid of any sense or character arcs. Where it scores though, is in taking the franchise in an entirely new direction, giving the Dinosaurs personalities – a cracker of a move, and one that will entirely make us question whether Malcolm had a point all along and whether mankind should have come as far as it did. Jurassic World: Fallen Kingdom is in cinemas now and in cinemas Stateside on 22 June 2018. Avengers: Age Of Ultron has all the ingredients (too many to count) of an overcrowded cinematic disaster, but true to its previous form in the franchise’s first installment, Whedon delivers on an epic scale yet again. Thor: The Dark World presents us with a wondrous tale filled with sweeping mythical landscapes and three dimensional characters says our guest columnist Ralph Redfern.